Juventus want Spurs midfielder Paulinho Italian giants Juventus are targeting Tottenham Hotspur struggling midfielder Paulinho, according to Mirror reports. 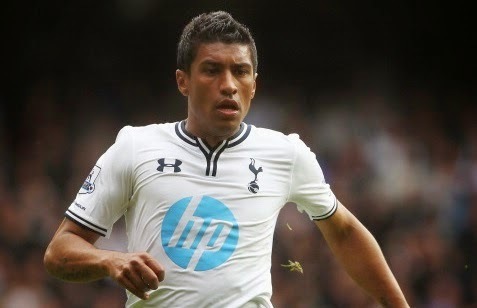 Italian giants Juventus are targeting Tottenham Hotspurs struggling midfielder Paulinho, according to Mirror reports. Spurs midfielder Paulinho has been struggling this season, with only making countable appearances for the London side, the Brazilian is looking for first team action. He is yet to start his first Premier League game this season. Etienne Capoue, Nabil Bentaleb and Ryan Mason all have been preferred over Paulinho by boss Mauricio Pochettino. It was also reported few weeks ago that his homeland club Cruzeiro are planning to bring him back. The 26-year-old joined Spurs from Corinthians for a fee around €22million in 2013 but despite of having a fine debut season he is usually found on bench this term. Tottenham Hotspurs have no plans to keep him at White Hart Lane and would only listen to permanent offers. Serie A duo AC Milan and Inter Milan have also linked with the Brazilian midfielder, as per Sunday People but with the recent reports from Mirror the Serie A leaders are likely to win the race. Spurs manager Mauricio Pochettino is planning to utilize the transfer fee of midfielder on Sevilla striker Carlos Bacca who has been strongly linked with the London side. Emmanuel Adebayor and Roberto Soldado are also likely to leave White Hart Lane this month.